Loves anything of the Nightshade family. And raring to go again. Depositing an egg to live off another. The garden went dry for a while, nothing to be seen for weeks. Now it’s populated again, all the young have grown it seems. And I can’t bend forward yet to capture most. But here’s a few from a height. 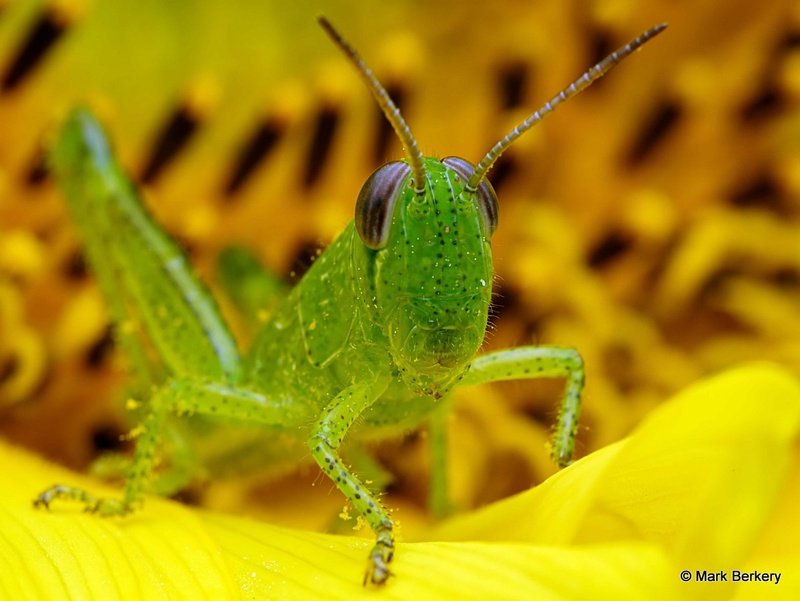 The Grasshoppers can have the Sunflower, lives in the maturing head apparently – better watch out for the visiting Mynas. 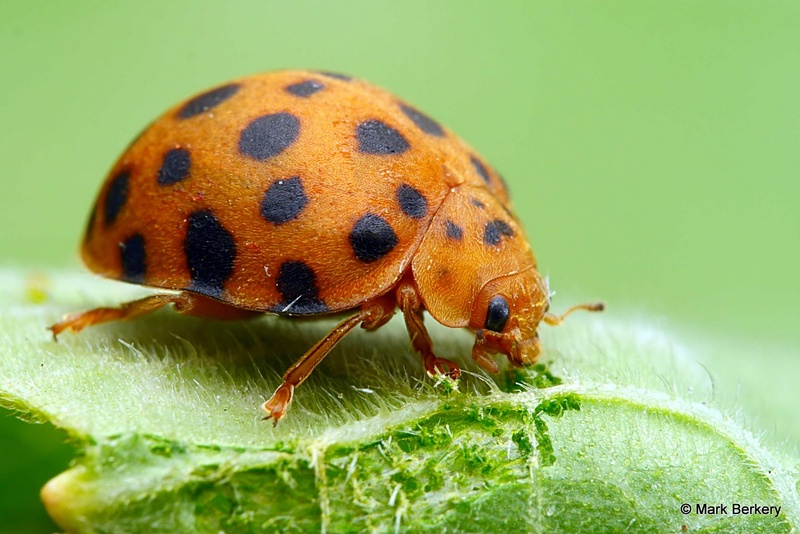 The Ladybug Potato Beetle can have the Melon Vine, food for others too. 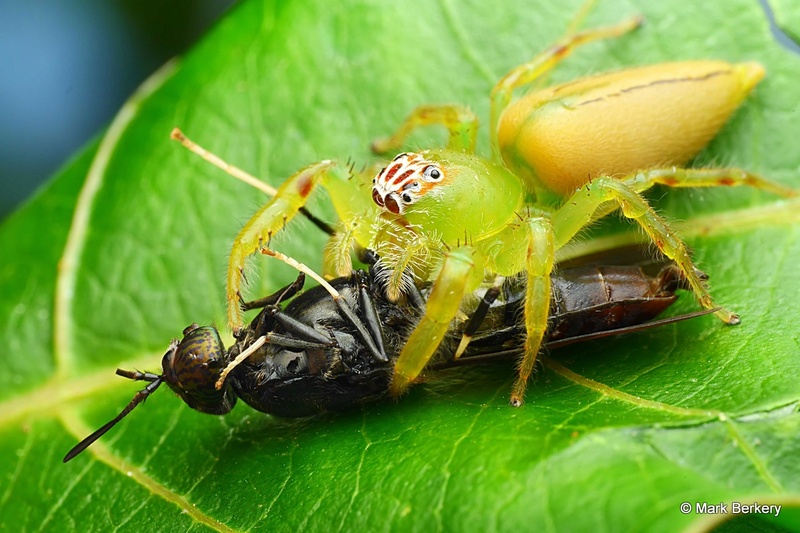 Jumping Spider lives and hunts in the Passion-fruit Vine, Soldier Fly for this meal. 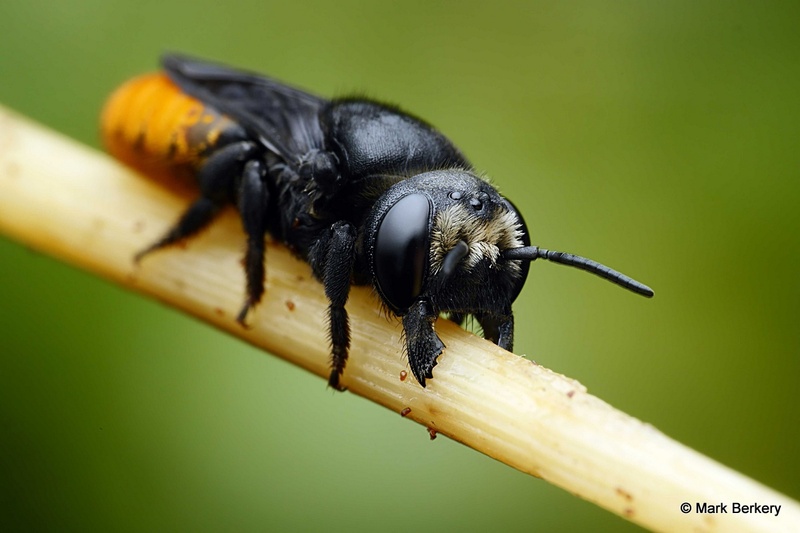 Another Bee rescued from a watery grave, vigorous little thing. 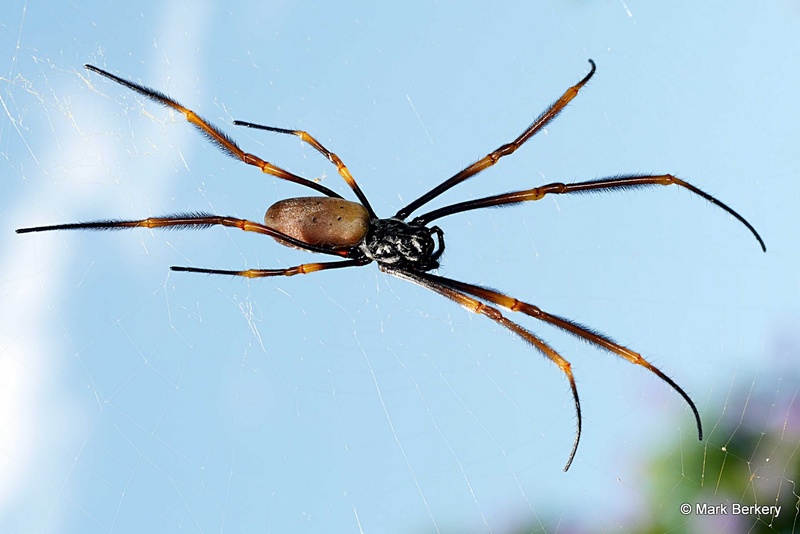 Golden Orb Weaver lays in wait to catch them all, gets fat doing it, 4” leg span, stickiest web around. Nothing is alien to the garden, or it’s all alien. Nothing like some interaction with nature to help with recovery:) Fantastic photos as ever, I particularly like patterns on the jumping spider. Personally I have always enjoyed opiods after surgery but so far never had a problem coming off them. Other than that I cannot tolerate pain killers so the old ‘separating mind from body’ stuff is necessary. Interestingly there are some kinds of nerve pain that prevents that, ie dental work and severe migraine, so I am clearly not mastering the skill yet. Thanks S … I just need to be careful for the next 6 weeks, I’m told. Sounds easy enough but it’s also easy to overdo the exercise, just walking so far, and precipitate the need for PK’s. You’re right, acknowledgement of the good, as nature or otherwise always helps some, with any pain. Sense and sensation is the antidote to mind. Or I, mind, am baked in here. Thanks Therese. Nothing too, just open surgery requiring some extra care to heal. Stunning photos for not being able to bend yet 😊! There’s that many in the garden now enough are at a reachable height. Lucky me … :-) Though I forgot about the wound once for a few seconds. Thanks Kathy. It appears some distraction is necessary at times – why we do things, but where drug use reveals some personal emotional attachment the best way to mitigate against recurrence of such is to experience the discomfort without judging or holding on to it in any other way. Passing through it without making more personal emotion – is there another kind, that way it is diminished in essence and not just avoided for now. In my experience. Oh yes, I agree – not being a proponent of pain killers myself I’ve found that separating the physical sensations (pain) from the mental state of said pain is a helpful way to pass through that phase of any surgical/medical procedure. I’ve been asked why I’m staring up at the ceiling lights with a blank look on my face and my reply is ‘I’m disappearing for awhile’. It helps for sure. 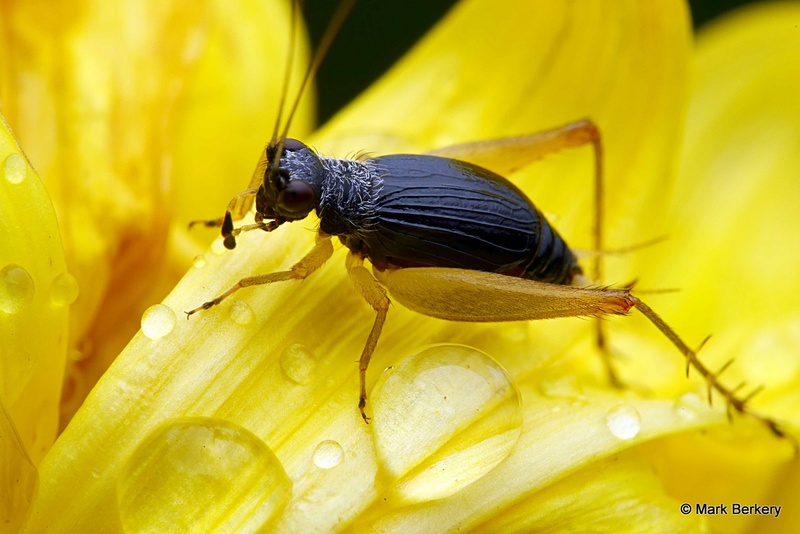 So photographing insects is another way to disappear from the pain for awhile. Better than any drugs! Yes, separating the fact (pain) from the mental (fiction) is necessary, one way or another. Everything has its time, doesn’t it. It does indeed. Thank you for sharing your thoughts and reading my thoughts on the subject. I am lucky with regard to opioids – still the only really effective painkiller/s – in that I was never much attracted to their psychological effects so stopping them has been relatively easy for me. Meditation, will power, time and experience help. Today is day 3 off them and I’m almost over 2 weeks of use, necessary and cautious use. For every ‘up’ there’s a ‘down’. They have their uses for sure – personally I don’t care much for how they affect my brain or my stomach so I’ve learned to cope by using my mind. Just a method that works for me. Pain is an arbitrary entity that we deal with however we can. Glad you’re off of the pain killers. Hope too that recovery becomes more tolerable for you. If your photos are any indication of your state of mind then I’d say you’re on the right track. They’re phenomenal! A beautiful assortment of images, Mark. I hope your recovery continues well and quickly! Thanks Cate. Doing well enough, just getting over the impact of the 24/7 drugs. Wow what an exceptional photo of that wasp!! Thanks F…. She kept moving this time for some reason. incredible photographs! Exquisite. I love them. I don’t quite understand the egg layer. Does it come out of her back? Thanks Mary. 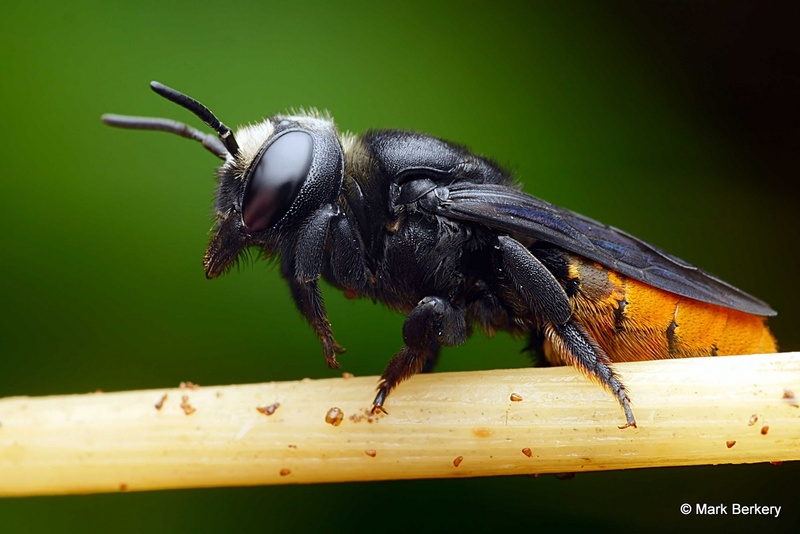 The rod descending from her rear goes into the bees nest about twice the length you see and down it she delivers an egg. 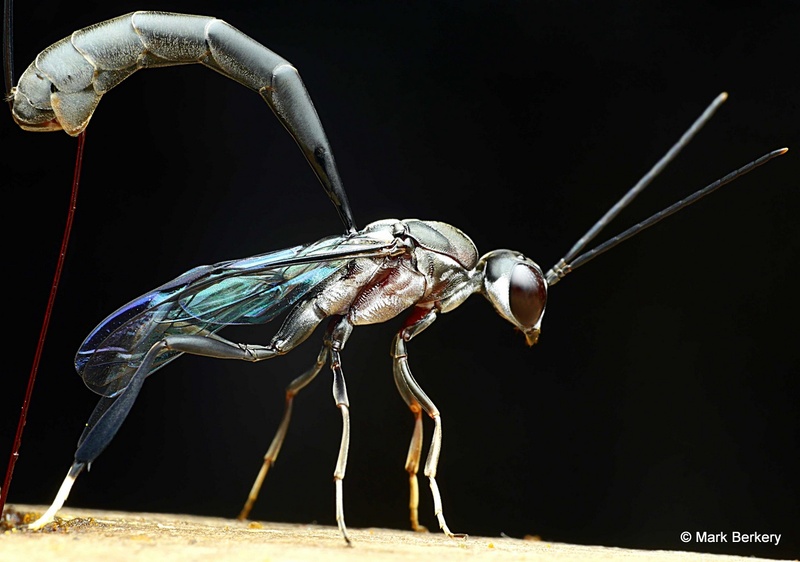 The wasp certainly looks alien. I know I’m reading into it what is not there but to me the jumping spider’s eyes give it a mean or angry look as it goes after its prey. All very nice photos. Thanks David. You are reading into it. Jumping spiders are considered playful, even cute. Often they will jump on the lens or around about that seems intent on frustrating the photographer, and the big eyes make them look almost soulful. Unless they are eating … :-) This one was feeding at different sites along the flies body and head, until properly drained of nourishment. Another amazing set of images. As always I love your poetic prose that accompanies your images. Seems that the garden is a very busy place again. You should see the bees under the veranda, there are more than ever. WOW ! 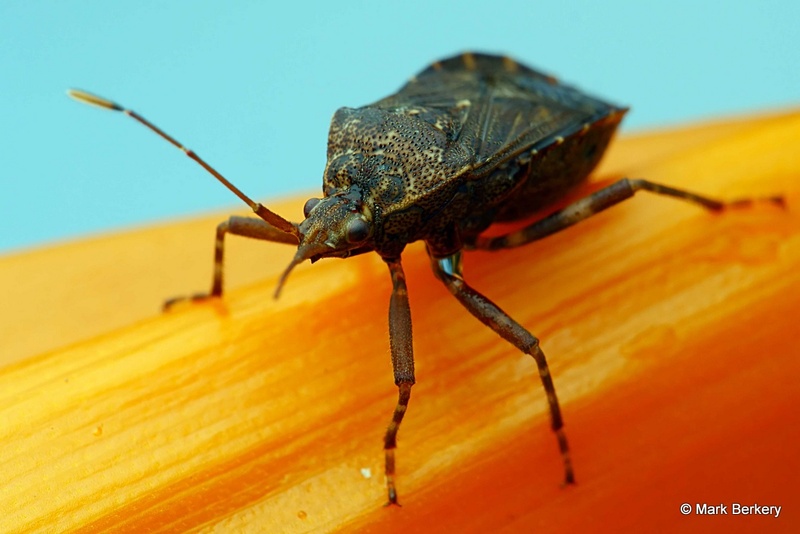 Glad these bugs are small. Ha, ha … The spiders are big enough to make me wary.